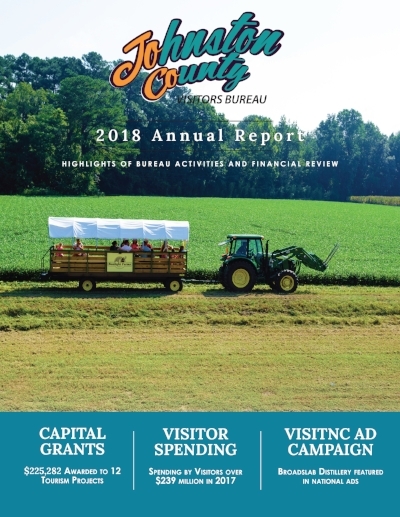 Annual reports|Johnston County Visitors Bureau. The staff of the Johnston County Visitors Bureau prepares a financial overview for the County Commissioners as each fiscal year is completed. A presentation is made on the year&apos;s accomplishments and the bureau&apos;s future goals for growing tourism in the county. The following report is for the FY Year 2017-18 and we welcome any questions or requests for additional information. Click on the cover to download the full report. The following are links to past annual reports for the community to review.